The culmination of the AFL-NFL merger in 1970 made possible the birth of new pro football rivalries, perhaps most notably that between the teams located in New York City. On November 1, 1970 the long-established Giants met the younger league’s Jets for the first time in a regular season game. While the Jets, coached by Weeb Ewbank, had experienced more recent success with back-to-back AFL Eastern Division titles in 1968 and ’69 and a victory in Super Bowl III, they came into the contest against the Giants as ten-point underdogs. The squad had been decimated by injuries, most notably the broken wrist suffered by star QB Joe Namath but also including the loss of both starting running backs HB Emerson Boozer and FB Matt Snell. As a result, their record was 1-5 as they prepared to meet their intra-city rivals. Meanwhile the Giants, coached by former star running back Alex Webster, appeared to be on the upswing after six years of not breaking the .500 barrier. 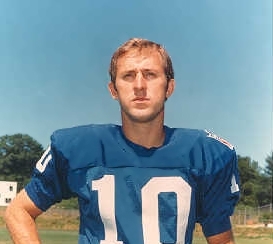 QB Fran Tarkenton (pictured above) was joined by HB Ron Johnson and WR Clifton McNeil to fuel the offense and, while the defense had its share of holes, it also had DE Fred Dryer, LB Jim Files, and FS Carl “Spider” Lockhart to bring talent to the unit. After losing their first three games, they had won three straight to improve to 3-3. A record crowd of 63,903 was in attendance at Shea Stadium. They saw the Jets score first on a pass from QB Al Woodall, the fill-in for Namath, to HB George Nock that covered eight yards. Still in the first quarter, Pete Gogolak booted a 25-yard field goal for the Giants. The score remained 7-3 at halftime. The Giants had difficulty on offense and Tarkenton completed just two of eight pass attempts in the first half. The Jets added to their lead with a 31-yard field goal by Jim Turner in the third quarter. The game then took a significant turn, however, and oddly enough, the Jets were victimized by their own success on defense. The Giants, down 10-3, drove into Jets territory and had a third-and-goal situation at the one yard line but failed on two plays from there – the last with FB Tucker Frederickson coming up a foot short of the goal line - and had to turn the ball over on downs, although not before a bench-clearing brawl ensued between the teams. Frederickson had attempted to lateral back to Tarkenton at the end of the fourth-down play, which was already blown dead, and the veteran quarterback was tackled by Jets LB Larry Grantham. Words ensued between Tarkenton and Grantham, and they were followed by CB Earlie Thomas of the Jets throwing a punch at Tarkenton. Both benches quickly emptied. Once order was restored and the Jets took possession, two quarterback sneaks by Woodall failed to gain ground and then FB Chuck Mercein (an ex-Giant) was tackled in the end zone by Jim Files and Fred Dryer for a safety. Losing by 10-5 and getting the ball following the free kick, the Giants struck quickly when Tarkenton passed to Johnson for a 50-yard gain to the Jets’ nine. The remaining distance was covered on the next play as Tarkenton passed to TE Bob Tucker and, with Gogolak’s extra point, the older club was in front by 12-10. On the next Jets series, Woodall was picked off by CB Willie Williams who proceeded to return the interception 36 yards to the Jets’ 29. Three plays later, and helped by a face mask penalty on the Jets, Tarkenton threw another touchdown pass of 11 yards to Clifton McNeil. The Giants had scored 16 points in a period of six plays that covered less than two minutes of the third quarter to take control of the game. After the flurry of excitement, the remainder of the contest was anticlimactic. Gogolak added a 37-yard field goal in the fourth quarter and the Giants ended up winning handily by a score of 22-10. The Giants barely outgained the Jets (240 yards to 237) while the Jets had the slight edge in first downs (16 to 15). However, the Giants sacked Woodall six times, to one sack of Tarkenton, and the Jets turned the ball over four times while the Giants suffered no turnovers. Overcoming the rough first half, Fran Tarkenton ended up completing 11 of 22 passes for 153 yards and two touchdowns with none intercepted. Ron Johnson (pictured below) rushed for 69 yards on 25 carries and also caught two passes for 52 more yards. Bob Tucker and Clifton McNeil each had three catches, for 41 and 35 yards respectively, and a TD apiece. 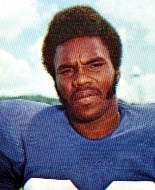 For the Jets, Al Woodall was successful on 12 of 16 throws for 164 yards and a TD, but two were intercepted. George Nock rushed for 45 yards on 14 carries and FB Lee White was right behind at 42 yards on 6 attempts. TE Pete Lammons led the receivers with 6 catches for 73 yards. “The fight keyed our guys up,” said Alex Webster of the effect of the third quarter brawl on his Giants. It was the fourth win in a row of an eventual six straight for the Giants who finished second in the NFC East with a 9-5 record – they just missed the postseason. Meanwhile, the Jets dropped their fifth straight game and ended up placing third in the AFC East at 4-10. Fran Tarkenton ranked second in the NFL in pass attempts (389), completions (219), and yards (2777) while tossing 19 TD passes. He was named to the Pro Bowl. So was Ron Johnson, who was also a consensus first-team All-NFL selection. Johnson ranked second in the league in rushing with 1025 yards on 263 carries (3.9 avg. ), becoming the first player in Giants history to top the thousand-yard mark in ball-carrying, and also caught 48 passes for 487 more yards (10.1 avg.). His 1514 yards from scrimmage were the most in the NFL and he scored 12 touchdowns in all.